The Sé Catedral de Santa Catarina, known as Se Cathedral, is the cathedral of the Latin Rite Roman Catholic Archdiocese of Goa and Daman and the seat of the Patriarch of the East Indies. Located in Old Goa, India, the largest church in India is dedicated to Catherine of Alexandria. It is one of the oldest and most celebrated religious buildings in Goa and is one of the largest churches in Asia. The Se Cathedral was built to commemorate the victory of the Portuguese under Afonso de Albuquerque over a Muslim army, leading to the capture of the city of Goa in 1510. Since the day of the victory happened to be on the feast of Saint Catherine, the cathedral was dedicated to her. It was commissioned by Governor George Cabral to be enlarged in 1552 on the remains of an earlier structure. The actual construction of the church began in 1562 under the reign of King Dom Sebastião. The Cathedral was finally completed in 1619 and was consecrated in 1640. It originally had two towers, but one collapsed in 1776 and was never rebuilt. The architecture style of the Se Cathedral is Portuguese-Manueline. The exterior is Tuscan, whereas the interior is Corinthian. The church is 250 feet (76 m) in length and 181 feet (55 m) in breadth. The frontispiece stands 115 feet (35 m) high. 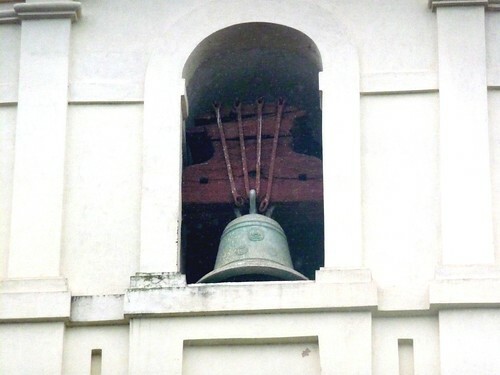 The Se Cathedral’s tower houses a large bell known as the “Golden Bell” on account of its rich tone. It is said to be the largest in Goa, and one of the best in the world. The main altar is dedicated to Catherine of Alexandria, and there are several old paintings on either side of it. On the right there is a Chapel of the Cross of Miracles, where a vision of Christ is said to have appeared in 1919. There are six main panels, on which scenes from the life of Saint Catherine are carved. There is a huge gilded reredos above the main altar. The Se Cathedral also houses a baptismal font made in 1532 which was used by Saint Francis Xavier, the patron saint of Goa, in order to baptise several Goan converts.